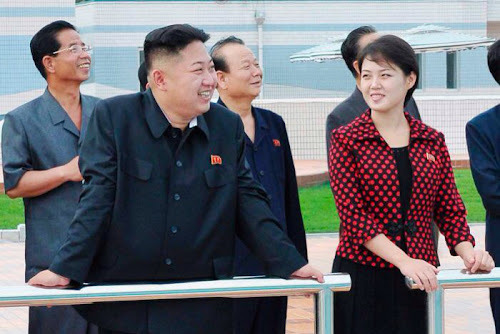 Pyongyang (AP) - A pairing of historic proportions has taken place in The Democratic People's Republic Of Korea, more commonly known as North Korea, as dear leader Kim Jong-un has wed an until now unknown partner named Ri Sol-ju in a ceremony described by state broadcasters as "completely legitimate and in no way constructed for political appearances". Critics claim this is an effort to transform the littlest Kim's image as an untested and rather pudgy child-king into a virile and masculine ruler teeming with sexual energy, but all indications from the notoriously tight-lipped regime appear to show a country in full celebration of this wonderous union. The state has issued an order to "display emotions of cheer and excitement" to residents nationwide for the next week and have taken unprecedented actions to ensure the proper enjoyment of the impromptu holiday for the newlywed leader, such as establishing the nation's first "amusement park", consisting of a three acre zone of abandoned farmland in which any visitor is mandated to smile enthusiastically or face "the extinction of the perpetrator's familial bloodline". Even those condemned by the regime have been invited to take part in the nation's pride, as state re-education camps have arranged to reduce the routine 18 hour daily torture sessions down to a paltry 16 hours for the remainder of the week. When asked to comment on the joyous occasion one detainee was quoted as saying "Please send help. My last meal was four days ago and consisted solely of the marrow cracked from my own amputated limb". And in an attempt to display their grandeur to the world, North Korea has planned an event they are calling "A night of 10,467 lights", where they will break with current restrictions by supplying electrical power to the entire country for a full 24 hour period beginning tomorrow morning, leading countless residents to prepare in excited anticipation for such luxurious activities as reading pre-screened state-sanctioned propaganda literature, and navigating their way to the communal latrines after hours without using the guide ropes. Indeed, spirits are running high in this land of stoic cynicism, and the international community looks on in patronizing approval of the country's meager efforts to appear powerful and relevant in the face of crippling cultural and economic shortfalls. Perhaps this is a sign of progress for North Korea in the years to come under the Dear Leader and his new bride, but many express their doubts that they will end their free-fall descent in terms of cultural, scientific, economic, and technological insignificance.